In today’s times, most companies in the processing & manufacturing industries have more or less stable project systems, procedures and best practices in place. This includes prioritization & execution processes. Many have understood the role of the PMO (Project Management Office) and have introduced and equipped it with a more or less stringent approach. So far so good. Right now, many companies undergo significant changes, mostly re-structuring & re-engineering efforts that target on new and more efficient business alignments, the operation of industry parks and trying to optimize allocated or unallocated project resource usage to mostly lower costs. Generally, the competence portfolio in the project management/execution world is changing and requires a high level set of skills and experiences. For example, the mere design engineering skills are not enough anymore. It is rather to deliver projects/plants/units/installations with competitive technology and the ability to ensure an optimal operations scheme combined with determined capacity. This goes beyond geographical borders and the need to ensure successful projects in remote areas. At the same time, project management/engineering resources on the market are scarce and companies compete to employ the best talents. The consideration of cost has additionally led to a minimization of knowledgeable resources. This shortage is supported by the age distribution in the companies as many experts have left for retirement. The contractor companies on the market benefit from this situation and do not engage in win-win alliances any more, they rather move from one company and from one project to the other. That leads to a lower probability of project costs and schedules. Efficient project systems need to support sustainable and best in class project results. Most companies use self-made programs because they believe this is the only chance to survive on the market. Nevertheless, there are state-of-the-art systems available that can support the improvement and result consolidation on projects, as well as build knowledgeable resources, led by standardized and benchmarked processes. The ITECS Health Assistant allows to combine several important tools to focus and streamline project organizations. A freely programmable and consistent “ScoreCard System” allows to tailor specific scorecard dimensions on the different levels and units in a company – no need to shuffle data from one system to the other, i.e. between Engineering/PMO/Business Unit. The ScoreCard extracts relevant measurements from an integrated and consistent data acquisition system (by user and/or data interface). The project execution work process is electronically modeled and helps to lead and train project teams, even relatively unexperienced talents. Different/concurrent/parallel processes can be assigned to the same project to ensure a maximal fit to the right project execution phase and/or model. Efficient standard ScoreCard dimensions are pre-configured and pre-loaded to support any enterprise. The portfolio management part allows to drill down the project portfolio and/or filter project groups to be executed. With these functionalities, project managers may oversee their project portfolio and interfaces between the individual projects, their status information and their deviations. Optionally, the system provides the basis for an accurate workload/workforce forecast system with a 6 months look-ahead/look back functionality. The forecast is based on existing project resource curves that can be replaced by standardized individual enterprise models, when needed. Through a set of dedicated mutual workshops, a clear understanding of the IHA-system, the specific enterprise related needs and their responsible roles will be developed. This information is used to establish the enterprise environment to ensure a highly efficient project system and top quintile project results. The following schematics demonstrates the interaction of all key components that build the ITECS Health Assistant system. All core components (marked in red) live on a collaboration and document management platform called “PIN ProjectServer“. 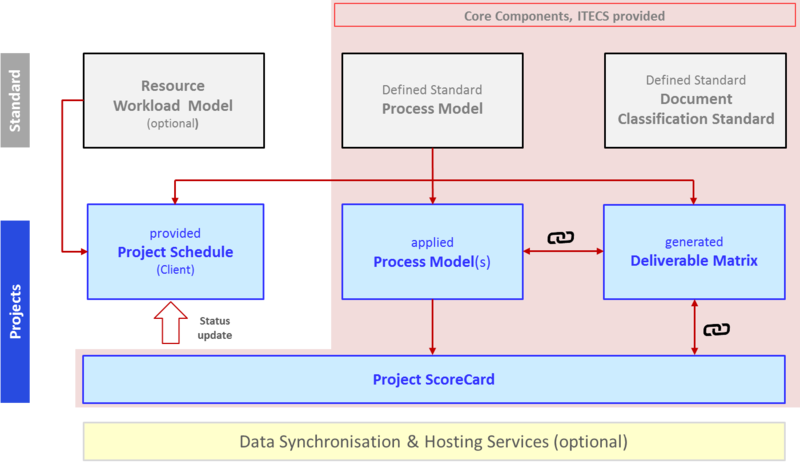 The components defining the system standards (marked in grey) will be applied to the components (marked in blue) of the real existing project world hosted on the platform. The ScoreCard components function as a performance data collector and at the same time as a data provider (e.g. project schedule, …). The underlaying data synchronization & hosting services (marked in yellow) ensure a seamless, consistent and automated data management between the components and any defined external data interfaces (e.g. SAP, Primavera, …). The system is 100% web based. Since it runs entirely on webserver technology, all users will just login to the platform and need no other tools or software installations to become part of a project environment. The business rules and processes shall be based on international or enterprise wide standards. This ensures that all documents and work processes (process models) are aligned to the company and/or project specific targets. The standardization and IHA application builds the foundation of project result comparability and benchmarking effort. The results are presented on an integrated drill-down or bottom-up project and/or enterprise ScoreCard dimensions. 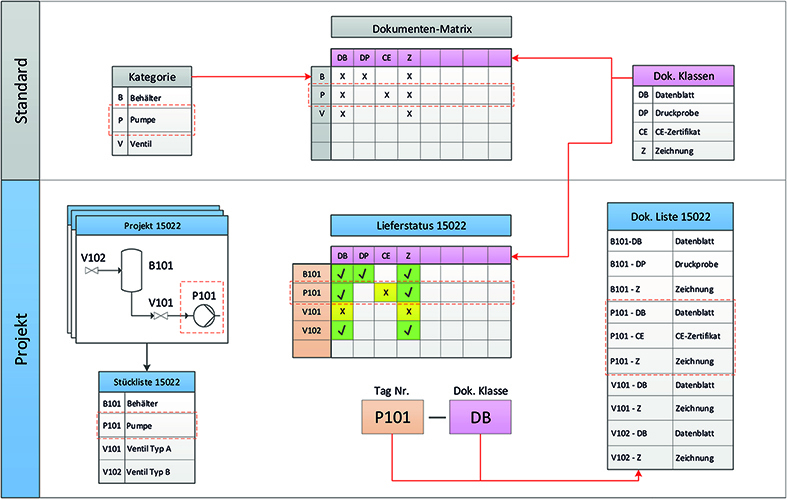 The following schematic demonstrates the deliverable matrix setup. The document classification standard (marked in grey) is the foundation of any project related document to be handled with the IHA-system. 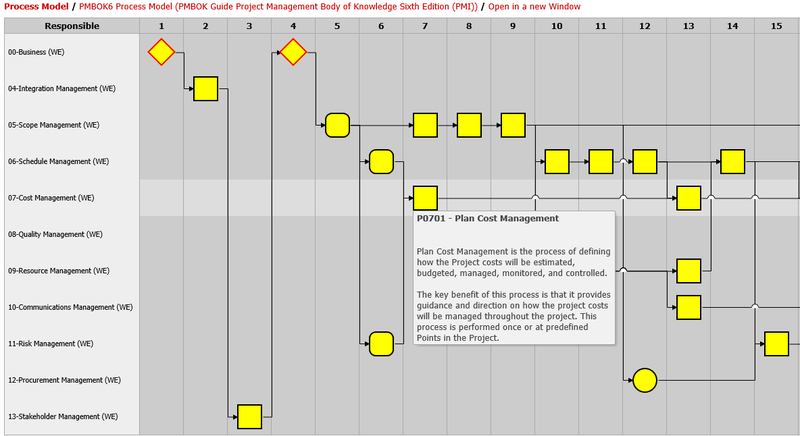 The deliverable matrix (marked in green) contains all necessary project documents. The Process model visualizes the project execution process steps, their relationships and individual fulfillment. 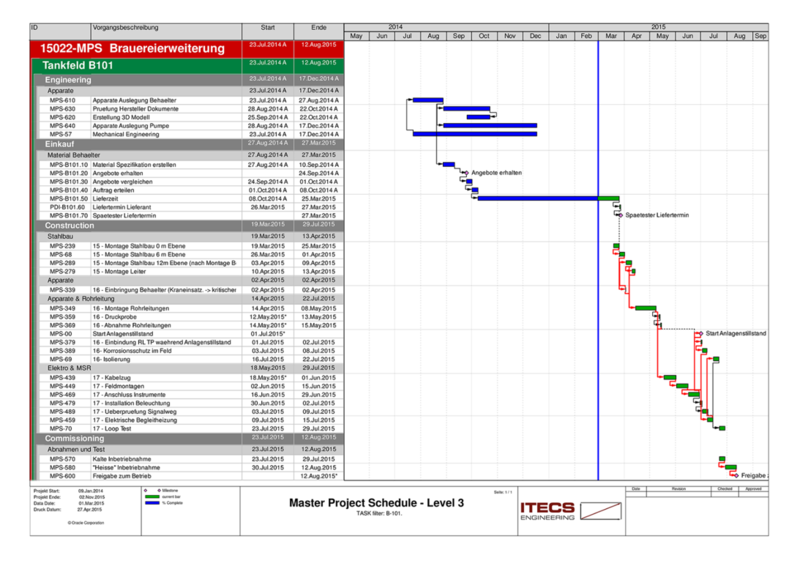 The following graph shows a typical master project schedule, which normally runs on existing schedule systems. The core components of the ITECS Health Assistant already provide templates and data interfaces to allow automated data synchronization and status update with, and of, the specific project schedule. However, this is typically an optional step during the implementation of the system on the client site. The Score Card builds a set of high level entry points that allow root cause analysis by easy drill down – it is the heart of the system. It consolidates the complete set of project performance data. The project team can select out of a variety of pre-defined key project perspectives (more than 40). These pre-defined key project perspectives have been created and compiled based on more than 20 years project experience in the process industry. The enterprise or their project teams can easily define/add/modify their own structure. This individual structure reflects flexible dimensions that fit needs of any organizational unit in an enterprise or the enterprise itself. 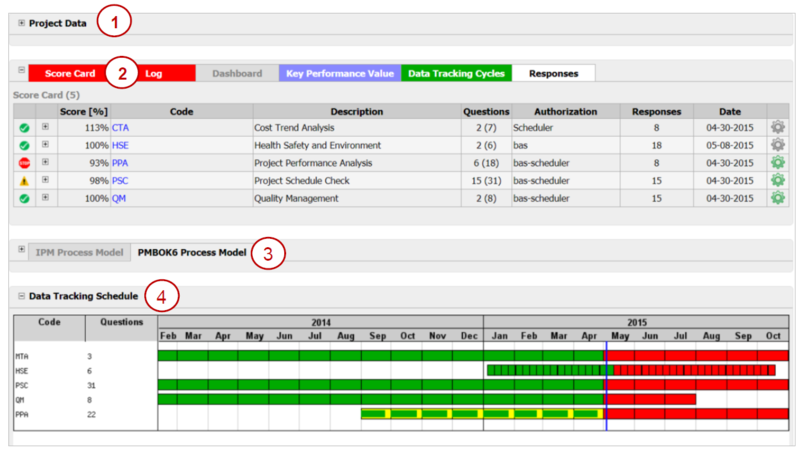 The „Project Score Card“ section consists of six coloured tabs (ScoreCard, Log, Dashboard Cockpit, Key Performance Value, Data Tracking Cycles, Responses) showing project performance and execution details. The „Process Model“ section is shon on the cockpit (here collapsed) and was described earlier in Chapter 2.2. The „Data Tracking Schedule“ section summarizes the data acquisition status and builds the data quality foundation for the calculated fulfillment and performance data.